Looking to make an impact once again this month, Jordan Brand is set to release a simple but elegant edition of the Air Jordan 1 Phat this month. 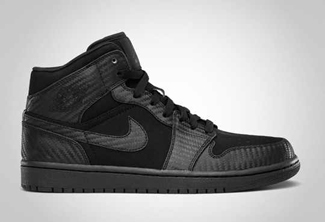 The Air Jordan 1 Phat will be released in all-black colourway that is dubbed as the “carbon fiber” edition of the famous Jordan Brand shoe. The model boasts a black upper part with textured paneling that resembles carbon fiber – a simple feature but very appealing! This shoe is set to drop in the market anytime this month so start saving money now and grab one. We can guarantee that you will never regret it! JB to Release All-Black Jordan TC This August!